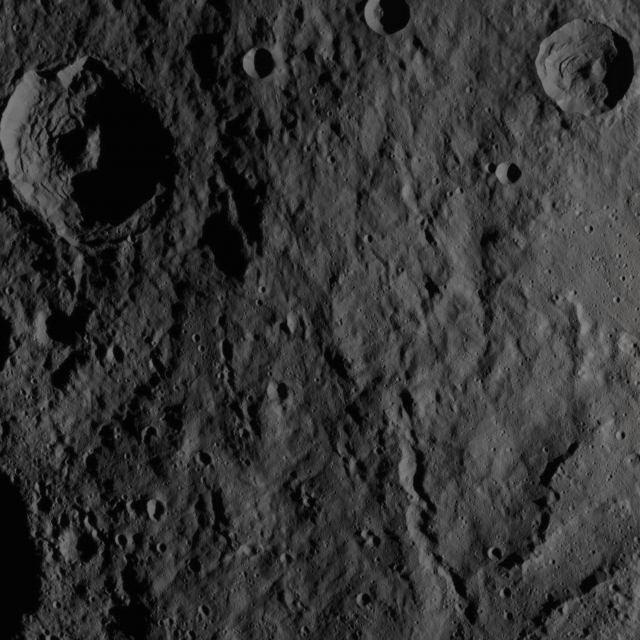 This intriguing Contextual Image (or "CTX Frame", for short) of the Dwarf Planet 1-Ceres, taken by the NASA - Dawn Spacecraft on October, 5, 2015, shows us some so-called "Hummocky Terrain", such as a Surface (of a Celestial Body) that is covered by low, rounded Hills, with numerous Impact Craters of varying size. The two biggest Unnamed Impact Craters visible here display very well defined Central Peaks and many places where masses of Material have collapsed and slid downward, along their Walls and Floors (---> a phenomenon, as you should already know, that Planetary Scientists and Geologists call "Mass" and/or "Gravity Wasting"). The sharp Unnamed Impact Crater visible at the upper right (Dx) of the frame is surrounded by smooth Ejecta and it also shows a streaky texture to the South. One almost Linear Feature - better yet: Fracture - of the Surface, measuring something in between 2 to 5 miles (such as about 3,218 to 8,0467 Km) in width, as well as two prominent Scarps, or even Linear, Cliff-like Slopes, are located - and extremely well visible - in the South/Eastern (lower right - Dx) quadrant of the image. This image (which is an Original NASA - Dawn Spacecraft's b/w and NON Map-Projected frame published on the NASA - Planetary Photojournal with the ID n. PIA 20125 - Dawn HAMO Image 63) has been additionally processed, extra-magnified to aid the visibility of the details, contrast enhanced and sharpened, Gamma corrected and then colorized (according to an educated guess carried out by Dr Paolo C. Fienga-LXTT-IPF) in Absolute Natural Colors (such as the colors that a normal human eye would actually perceive if someone were onboard the NASA - Dawn Spacecraft and then looked ahead, towards the Surface of 1-Ceres), by using an original technique created - and, in time, dramatically improved - by the Lunar Explorer Italia Team.